Catamarans are a type of multihued sailing vessel featuring two parallel hulls of equal size. The craft is geometry-stabilized; deriving its stability from its wide beam, rather than from a ballasted (weighted manually with sand, gravel or iron according to the load present on the boat) keel as with a monohull sailboat. The size of the catamaran can vary from small (sailing or rowing vessels) to large (naval ships and car ferries); while being either manually sailed or motorized. The structure connecting the two hulls can range from a simple frame strung with webbing to support the crew, to a bridging superstructure incorporating extensive cabins and/or cargo space. Being ballast-free and therefore lighter than a monohull; catamarans often have a shallower draft (depth) than comparably-sized monohulls, while also being faster. The catamaran’s wider stance on the water can reduce both heeling (leaning over due to the pressure of wind or an uneven load) and wave-induced motion, as compared with a monohull; and as such can give reduced wakes. This makes this craft very appropriate for activities that require minimal disturbances in the water such as fishing or whale watching. Catamarans were first developed over 3500 years ago by the Polynesians. These early examples were likely related to outrigger canoes and consisted of two canoes bound together with a wooden frame, sometimes accompanied by a sail. Despite their simplicity they were nonetheless effective, allowing the seafaring Polynesians to voyage to the distant Pacific islands. In the 5th century AD the Tamil kingdoms, of what is now known as, Tamil Nadu in South India had catamarans in wide use; though were different from those used by the Polynesians. As the Tamil word ‘kattumaram’ (from which the name catamaran was derived) suggests; these craft were made of shaped logs bound together with rope. These primitive catamarans served them well though and were soon adapted by the neighboring regions. The first example of catamaran development in the West occurred in Europe when it was designed by William Petty in 1662 to sail faster, in shallower waters, in lighter wind, and with fewer crew than other vessels of the time. However, the unusual design met with skepticism and was not a commercial success. The design remained unused for almost 160 years until the early 19th-century, when the Englishman Mayflower F. Crisp built a two-hulled merchant ship in Rangoon, Burma. The ship was christened Original. Crisp described it as "a fast sailing fine sea boat”, and she traded during the monsoon between Rangoon and the Tenasserim Provinces for several years. With the success of this boat more builders started creating catamarans and started realizing its advantages. Today both powered and manual sailing catamarans are available. They are widely used in ocean races, transport, cruising, sport and recreation and much more. Sailing Catamarans: Sailing catamarans have been noted for incorporating technological advances over traditional monohull craft. These include foils that lift racing catamarans out of the water, capacious and stable cruising vessels, and racers that have achieved average speeds on the open ocean, comparable to much larger vessels. Hence these catamarans are used for a variety of activities such as forms of recreation and sport where the vessel is launched from the beach, cruising and ocean racing. Powered Catamarans: Catamarans fill a comfortable niche amongst powered vessels, where speed and sea-kindliness is favored over bulk capacity. In larger vessels, this niche favors car ferries and military vessels for patrol or operation in the littoral zone. Two of the most important advances over the traditional catamaran are the SWATH and the wave-piercing configuration; the latter having become a widely favored design. The small-waterplane-area twin hull (SWATH) configuration reduces wave-generating resistance by moving displacement volume below the waterline, using a pair of tubular, submarine-like hulls, connected by pylons to the bridge deck with a narrow waterline cross-section. The submerged hulls are minimally affected by waves, and provide further advantages such as no possibility of planing, reduced pitching and etc. Wave-piercing catamarans employ a low-buoyancy bow on each hull that is pointed at the water line and rises aft, up to a level, to allow each hull to pierce waves, rather than ride over them. This allows higher speeds through waves than for a conventional catamaran. Powered catamarans are used for military purposes, passenger transport and cruising. The Oru, which is often mistakenly identified as a catamaran, is an originally Sri Lankan craft. They are vessels of great antiquity and their age can only be guessed at. The form of the Oru evolved from the need to build a watercraft, using the available bio-resources at the time, that would fit the nature of the existing inshore waters. The craft were made only of wood with all fastenings being of coconut coir rope; a technology common to the cultures of the Indian Ocean until quite recently. Oru are dual-element craft, comprising of dug-out hulls connected by spars, or booms, to outrigger floats. The entire craft was flexible and could cope with surf-induced torque. The hull being a monoxylon, its rounded bottom could withstand abrasion due to crossing sand spits and being hauled up the beach. It was essentially a “skimming” craft, with a hull that barely caused any displacement; and therefor technologically quite different from double-outrigger (common in south-east Asia, Madagascar and the east African coast). These Orus are used in Sri Lanka to this day, usually with modern additions to the vessel; such as the use of iron nails and nylon cordage in preference to coir rope; the preference for GRP over dugout logs for hulls; the use of outboard motors for propulsion instead of sails and rigging. However, in the rural villages orus are used in their original form, with coir rope, sails and dugout logs. 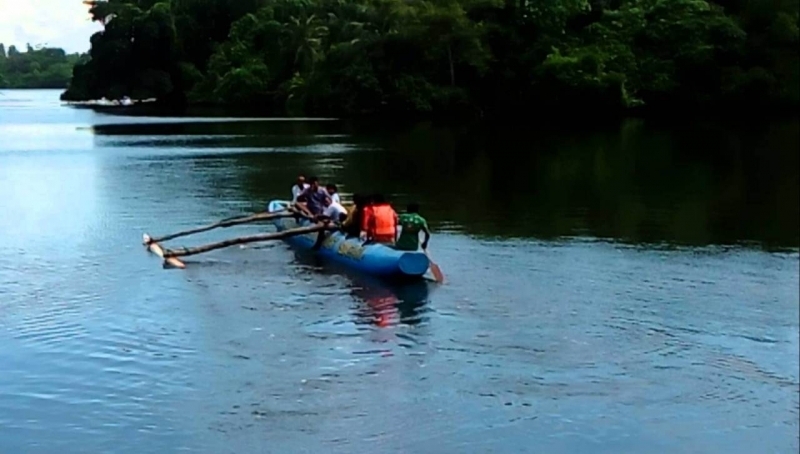 Other types of twin hulled raft in use in Sri Lanka are the traditional Kattumaram brought in from South India, and mostly used by fishermen in Jaffna; and the beach-seine boats called ‘mā-däl-pāru’ in Sinhala. This is a large, scow-ended craft with vestigial twin-hulls, a rectangular plan, a high freeboard, and which is used only for laying off-shore seine nets. Madalparu are rowed and not sailed. 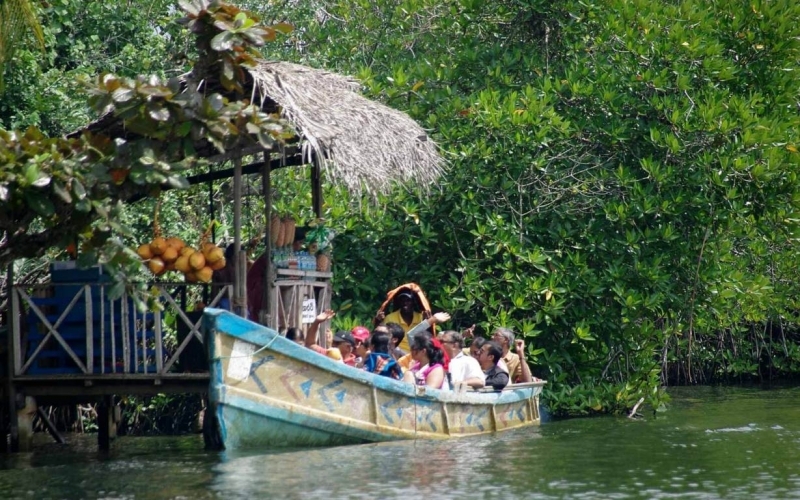 While the name says ‘catamaran’; the vessel you will be cruising in will be either an Oru or Madalparu, both traditional Sri Lankan craft that have been around for millennia. You will be taking an early morning ride in the Parakrama Sea; a giant man-made lake that was created centuries ago to provide irrigation. 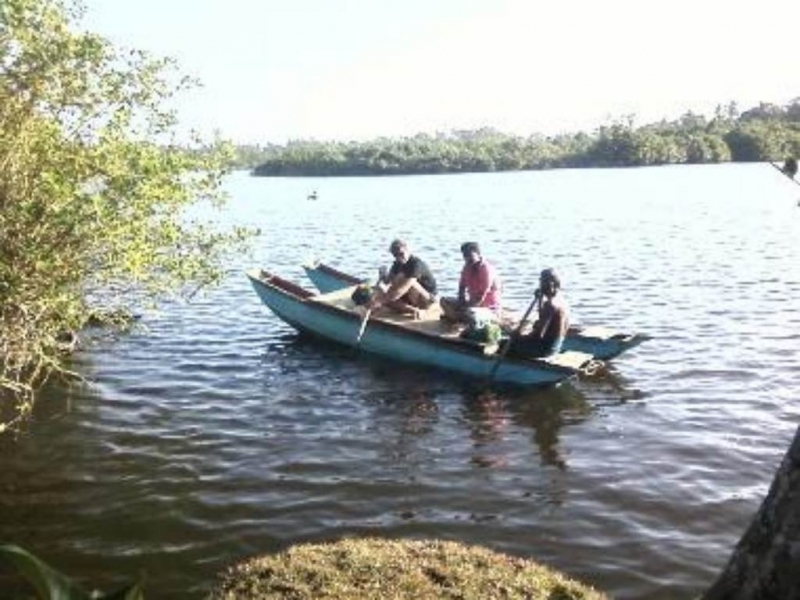 You will get to learn about the lifestyles of the local inland fishermen along the way and see some of their families too. You can watch the fishermen put out the nets and pull in the fish. Once he has sorted out the catch, he will take you on a safari across the lake. Along the way, you will be able to catch sight of many rare and migratory waterbirds that frequent the area. These include white-bellied fishing eagles, brahmi kites, ibis, and cormorants. In the middle of the lake you will be visiting a small island with a rocky outcrop that provides great 360° views of the lake and the forests beyond. 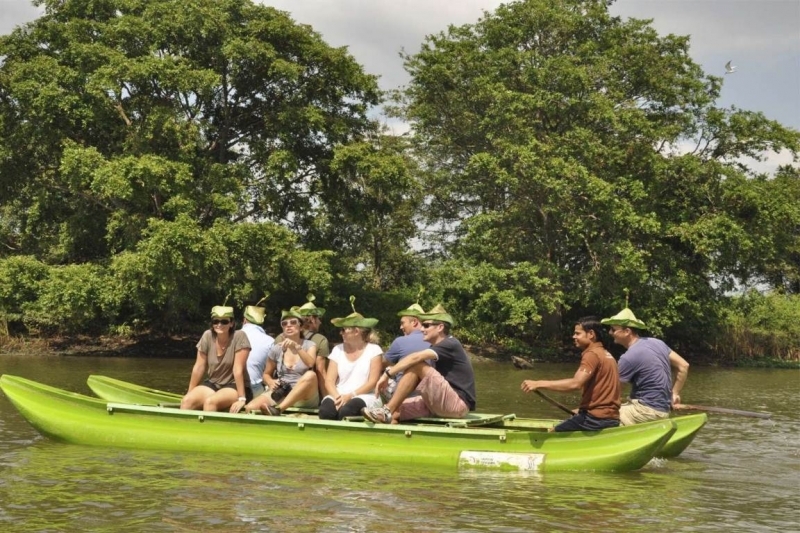 This tour aims to give you a traditionally Sri Lankan experience tailored for all ages.